The 46th edition of the iconic Pirelli Calendar was unveiled at the Pirelli Hangar Bicocca in Milan on Wednesday (December 5), revealing photos of Gigi Hadid, Misty Copeland, Julia Garner, Alexander Wang, Laetitia Casta and more, all shot by Albert Watson. The collection of photos, shot in Miami and New York back in April, is titled “Dreaming” and celebrates aspirational women in pursuit of their own dreams. 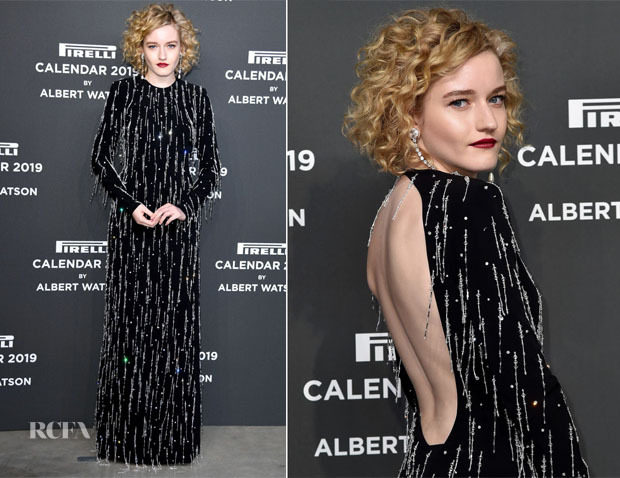 Press Conference: Julia Garner attended the press conference wearing a Victoria, Victoria Beckham Spring 2019 two-piece look. Some might find the crayola doodles a bit childish, but at times I feel like Julia’s style is quite serious, so I welcome this playful element. Gala: Things took a dramatic turn for the gala event which saw the actress wearing a Miu Miu black gown covered in scores of light-catching crystal beading which may look heavy from the front, but from behind, the open back shows just the right amount of skin.